It is the farming season again in Zimbabwe and we continue on our mission to convert struggling rural farmers to use natural, low cost, conservation agriculture methods that have proven to work year after year. However, this year we have decided to do something different – a challenge for 5 schools to bring their dry, failing agriculture plots back to green, organic vegetation using an eco-friendly approach with just a hoe! The school that uses the conservation agriculture training (provided by our partners Foundations for Farming) to the letter, will undoubtedly triumph and produce an exhibition plot that can be used every season to show hundreds of schools and families in the area that you only need a small area of land, mother nature and a hoe to produce a year’s food for a large family AND surplus to sell. During this farming season we will continue to train, monitor and support our rural schools and include some friendly competition to see who will achieve the best exhibition plot. We invited participants from years before, who live within the community, who were only too happy to confirm that the conservation agriculture programme has been life changing for them. Teachers and parents have been included in the training which will be passed to children and other families. The harvest will be used to fund much needed school development and our feeding programme so children can receive a nutritious meal every day at school and at home. We wish our schools all the very best! And to you – our faithful supporters – we wish you a wonderful festive season and new year ahead. We are proud to bring you our recently UPDATED WEBSITE giving details of our registration as the Feeding Minds Trust of Zimbabwe and the three programmes we are focussing on in the 9 primary schools and 7 ECD centres we are working. The programmes benefit over 5,000 children daily as well as their teachers and many more families within the surrounding communities. Our aims are to evolve the education and livelihoods of children, families and teachers in rural, destitute communities and schools by offering nutrition relief and innovative training techniques which provide independence, a quality education and a sustainable future. For £30/year a child in rural Zimbabwe can attend school for a whole year receiving a nutritious meal every day. Bridget lives with her mum and little brother (nicknamed Biggie) in a tin shack in a township just outside Harare. Bridget and Biggie have excellent school reports! Their mother is very passionate about education and takes them to school herself every day. They were skinny, severely malnourished and Bridget has been extremely ill many times due to dehydration and starvation. However, she still insists on going to school and on many occasions her mother has carried her to school on her back. Since we have managed to support Bridget and her family with donations received which include healthcare, consistent payment of school fees at a better school and nutritious meals twice per day, their health has improved dramatically – they are now hopeful, feeling more energised, happier and healthier. Look how much Bridget and her brother have grown! Every rainy season Bridget’s mother has to rebuild their shack several times which brings much distress to them all. We are delighted to report that we have received funding from 3 very generous donors to build a small two room brick house for Bridget and her family which cost US$3,000 (excluding the stand/land). Through her hard work and her mother’s dedication they will be a part of changing a destructive cycle for themselves and future generations. Thank you to everyone who supports Bridget and the many children like her! What are the UN’s Millennium Development Goals and how has Zimbabwe’s Children successfully achieved many with their programmes. Since its beginnings, Zimbabwe’s Children has worked closely alongside the UN’s Millennium Development Goals (MDGs), supporting the global goals of eradicating global poverty and improving the life chances of the world’s poorest communities. The eight Goals were set in September 2000 at the Millennium Summit, the largest gathering of world leaders in history. Together, their nations formed a new, global partnership that sought to reduce extreme poverty in its many forms – income poverty, hunger, disease, lack of adequate shelter and exclusion,- as well as to promote gender equality, education, and environmental sustainability. A deadline was set for 2015, resulting in a period of fifteen years which has produced the most successful anti-poverty movement in history. The world has since made significant progress in achieving many of the Goals, with the number of people living in extreme poverty declining by more than half (from 1.9 billion in 1990 to 836 million in 2015). In September 2015, a global summit was held at the United Nations in New York, where world leaders committed to continuing the progress made in the new Sustainable Development Goals. But the UN reports that these progresses have not been experienced worldwide. There are huge disparities within countries, where poverty is much more prevalent in rural areas than in urban areas. Sub-Saharan Africa has also been referred to as the “epicentre of crisis,” facing a widespread shortfall for most of the MDGs. The region has seen continuing food insecurity, a rise of extreme poverty, high child and maternal mortality, and large numbers of people living in slums. 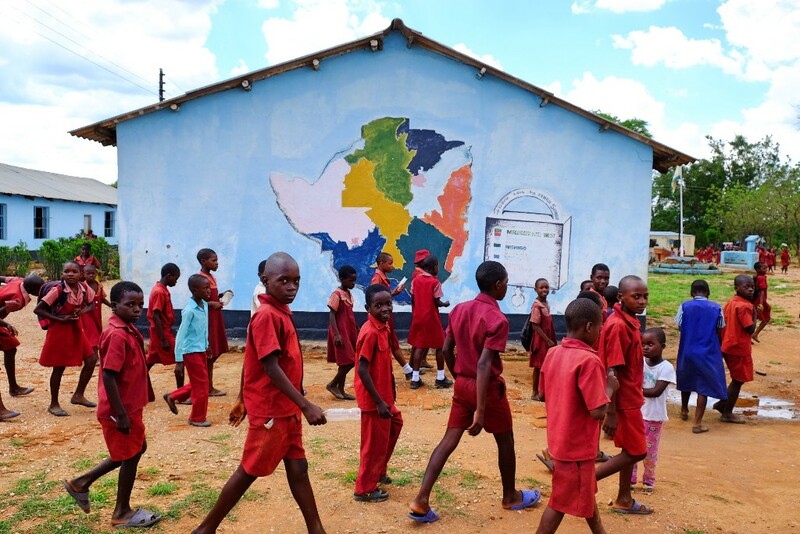 Zimbabwe’s Children works in the remote, rural region of Chinhoyi and the Hatcliffe Township in northern Zimbabwe, where communities have experienced the full impact of poverty. We have implemented a number of projects that ensure as many Goals as we can are met and that the families living here experience the benefits of our achievements. We have had much success in all areas of the agenda in this part of Zimbabwe, thanks to our funders’ generous and loyal support, and the hard work of our dedicated team. Over 7 years ago Esther, Grace and Obert told their stories to millions of viewers. Their lives changed overnight. As they grow up and forge their own paths – how have their stories changed the lives of other children? Years of dedication, hard work and your support are bearing such sweet fruit in Zimbabwe. Here is evidence your donations have changed lives for Zimbabwe’s Children. If you have made a donation to us between 2012 and 2016, we are asking that you kindly gift aid it. For every £1 you give us, we can claim another 25p bringing your total to £1.25. It has been a very busy January in Zimbabwe as it is the start of a new school year and the feeding program, with our partner Ruffs Kitchens, progresses and expands further within the rural area of Chinhoyi. The current rainy season has brought heavy rains on very dry land, causing flooding and making our mission of delivering food to remote schools an extremely challenging task. Our team have worked day and night to make this happen and we are proud to be a part of feeding 4,100 children with a highly nutritious mahewu meal every day at 7 schools and 5 ECD centres (nursery/preschool). Thank you to everyone who supports our work as this would not happen without you! How are Esther, Obert and Grace? Our dedication to Zimbabwe’s Forgotten Children is unquestionable. With the support of our extremely loyal and generous donors throughout the world, we can reach many more children just like Esther, Obert and Grace – the 3 who started this, and will continue to champion our cause for thousands more children! Speaking of which – how are Esther, Obert and Grace? In one word – GREAT! Can you believe it’s been 6 years since we were introduced to them in the film Zimbabwe’s Forgotten Children? Esther and her (not so little) sister Tino live at the SOS Children’s Village outside Harare in a safe, secure and loving environment. They are excelling in school as can be seen in this short film of Tino reading from one of her school exercise book. Esther is a young teenager now giggling with her friends and asking when she can travel out of Zimbabwe to the UK to meet everyone. We remind her that she has been a huge part of changing many lives and she simply replies” That’s good – it makes me happy”. She really has no idea! Grace still lives in her family home and Michelle has recently got married and had a baby son called Leo. During 2016 Grace continued with her studies (thanks to you, our loyal donors) at Young Africa College where she has been studying for more O’level subjects. Young Africa is the same college she attended to get her Early Childhood Development qualification to be a Nursery teacher. She is presently looking for more volunteer or paid work as a Nursery assistant, whilst studying. Obert is in the last stages of his A’level exams – thank you to everyone who sent him a message on our Facebook page, he was very grateful to receive your support. We are in the process now of moving Gogo from her home in the rural areas to a small 2 room home nearer the town (thank you Fredrik Eklund and Derek Kaplan) as she requires constant medical attention after many years of working extremely hard farming land. This is a big step for her and one she has wanted for so long so she can see more of Obert and be closer to our Community Field Officer, Peter, who has become like a son to her now.